As the weather gets colder and we look for gifts to crochet for loved ones this winter why not try to make a pair of slippers with cuffs to keep a loved ones feet warm? I created these easy and fast slippers using Bernat Softee Chunky yarn in Royal Blue and a size H Crochet hook. But they could also be made using worsted weight yarn and holding two strands together. These are pretty easy to make I made them to fit a women's US Size M 7-9 but they can be modified by reducing or adding to your first chain stitch. 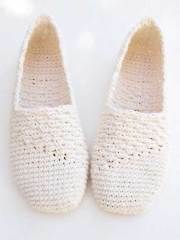 This slipper is made by crocheting a rectangle approximately 9" wide by 10" high and single crocheting the rectangle together or using a tapestry needle to sew up the ends. The toe is at one end and the heel is at the other end of the slipper. Pull the toe together tightly in order to gather a toe and stitch or crochet a seam in the heal leaving enough yarn for your foot to go in. Materials: (2) 3.5 oz Skeins of Bernat Softee Chunky yarn or two strands of any regular worsted weight yarn held together throughout the pattern. Row 1: DC in 1st chain from hook and in each chain across, ch 1 and turn. Row 2: DC in dc across the row, ch 1 turn. Holding the slipper closed on top sc approximately 10 sc stitches on top to close the slipper (just be sure that your foot hole is not too small or too large to slip your foot into). This Pattern crochets up quickly and can be made in any size by varying the number of stitches and rows. The pattern is basically a rectangle that is crocheted into a pair of slippers with cuffs. The pattern can be worked with a thick yarn or with a worsted weight yarn and holding 2 strands together. The pattern below is for a women’s size 7-9 approximately but it can be adjusted by varying the stitches and the rows in the rectangle. Note: The toe is at one end and the heel is at the other end of the slipper. Pull the toe together tightly in order to gather a toe and stitch or crochet a seam in the heal leaving enough yarn for your foot to go in. Next Round - Holding the slipper closed on top sc approximately 10 sc stitches on top to close the slipper (just be sure that your foot hole is not too small or too large to slip your foot into). Crochet Quick and Easy Slippers is for your whole family, from youngest to oldest! Flat pieces are constructed like a moccasin with gathered ties for a comfortable and custom fit. Girls/Ladies style includes a ruffled top edge.Crocheted with Bulky yarns, they are sturdy, warm and work up quickly for the perfect last minute gift! Models shown in Premier Serenity Chunky yarns sold at AnniesCatalog.com and only 1 skein needed for child sizes and 2 skeins for adults. Instructions are included for 7 sole dimensions ranging from child small to adult extra-large.